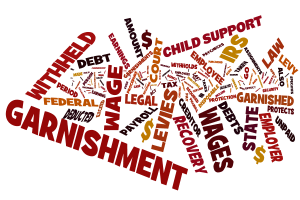 A wage garnishment is a legal process that requires an employer to withhold a portion of an employee’s wages to satisfy a debt owed by that individual. The garnishment order can be issued by a court (such as for unpaid child support, alimony, and unsecured consumer debts, including credit card and medical bills) or a government entity (such as for unpaid taxes and student loans). Title III of the Consumer Credit Protection Act (CCPA) is the federal law that limits the amount an employer can deduct per pay period for regular wage garnishments plus child support and alimony. The law also protects employees from being fired because of a single wage garnishment. For a regular wage garnishment—such as for unpaid credit card or medical bills—employers can deduct the lesser of 25 percent of a debtor’s disposable wages for the pay period or the total by which the disposable wages exceed 30 times the federal minimum wage, which is presently $7.25/hour. For child support and alimony, employers may deduct up to 50 percent of disposable wages if the employee is supporting another child or spouse, and up to 60 percent if he or she is not. Employers can deduct an extra 5 percent for support payments that are more than 12 weeks late. Although federal government entities, such as the Internal Revenue Service (IRS) and U.S. Department of Education, do not need a court order to garnish wages, they must follow specific rules and are limited in how much they can deduct from debtors’ income. State law determines whether debtors’ wages can be garnished. As of 2018, the following four states prohibit wage garnishment for creditor or consumer debts: Pennsylvania, Texas, South Carolina, and North Carolina. All states, however, allow wage garnishment for unpaid child support, alimony, student loans, and taxes. Penalties for violating Title III of the CCPA include reinstating the discharged worker, paying back wages to the affected worker, and restoring any improperly garnished amounts. Employers who willfully violate Title III can be fined at least $1,000 and may be criminally prosecuted or imprisoned for up to one year. Note that the IRS may assess its own penalties on employers who fail to honor an IRS wage garnishment or levy. Employers can avoid the consequences of noncompliance by following the provisions of the respective wage garnishment law. If you outsource garnishment administration, be sure to give the service provider the information needed to ensure accurate processing. To sort through this multifaceted process and ensure compliance, contact us today.